For example, in countries such as Kenya, as much as 60 percent of families are led by single moms. And in places like Chili and Columbia, between 25 percent and 35 percent of families are led by single mothers who face extreme poverty because they most commonly find work as manual laborers, making very little to support their families. Being a single mom isn't easy. According to the United States Census Bureau, there are approximately 9.9 million single mother families within the United States today, with 126,000 of those mothers living in Minnesota. And while most of these mothers in Minnesota are working, 34 percent with children under 18 are still living below the poverty line, and 42 percent with children age 5 and under living below the poverty line. Pray. This week we will pray for the single moms who lives close to us and the ones who live across the world. We will pray for provision and support, protection and safety for them and their children. We pray for wisdom and strength as they raise their children. The gang of us who ran the boutique last year! Fast. Unsure what to fast from this week, I asked one my my friends, who is also a single mom, for her suggestions. She shared that lack of sleep and carrying the weight of all the household responsibilities were some of the most challenging things she faces. So this week, we will give up one extra hour of sleep each night to pray, understanding that many single moms don't always have the luxury of sleep. And we will also carry the burden of some extra household "chore" that we usually don't have to do as a reminder of the difficulties single moms face every day. Give. This week we will be collecting specifically for the single moms retreat, Dare to Dream, that we had the privilege of helping with last year. 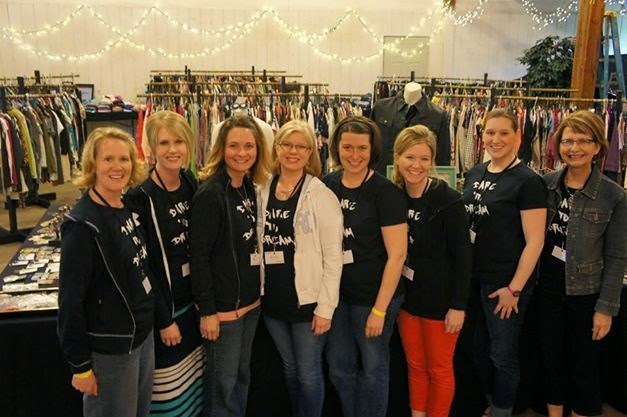 We will collect new and gently used clothing, accessories, shoes and jewelry -- and we'd love for you to join us! If you have things you'd like to donate, message us. If you'd like more information about the retreat, whether to attend or volunteer, you can check out all the details here. Single Mom's Retreat from MDC.AG on Vimeo. I love that you are focusing on single moms during this lenten season. I am a single mom and I love the idea of giving up an extra hour of sleep to recognize that single moms many times lack the rest they need. So glad to be visiting you today from (in)couraging writers! Blessings, Mary!